This was the sound of my panic recently. I ran out of ideas for feeding my family. I’m not one to run out of ideas. For years I heard people confess that they no longer know what to make their families for dinner, that they were sick of making the same things over and over, that they were tired of buying the same groceries every week. Then Pinterest happened, and I stopped hearing it as often, but maybe it’s because I wasn’t really listening and instead was being smug about always knowing what we’re going to eat. I blame the loss of dinner mojo on our new crazy schedule. Recently we’ve been so busy with practice and school functions and games and youth group that I haven’t cooked much at all, opting to make pots of things in the middle of the afternoon and then slapping spoonfuls on a plate prison-style when my family members wandered through the kitchen at any time between bus drop-off and bedtime. Sometimes I’d even heat it up for them. And sometimes they’d just eat Doritos out of the bag and I’d pat myself on the back for being awesome. Then one day we were all magically going to be home at the same time FOR DINNER. And I needed an idea. I regarded my offspring as if she held the key to unlocking the secrets of the universe. And this is what I made. Hang onto your hats, because I’m about to blow your mind. 1 lb. ground beef. You have some; I know you do. If you want to use turkey, that’s fine, if your family enjoys eating ground turkey instead of beef with their tacos. Mine doesn’t anymore, because when they complained about it once, I went crazypants on them and screamed “EEEEAT IIIIIIT!” until their plates were clean. 1 envelope taco seasoning. Or half of one, or a portion of one, whatever you have. Or you know what? Just use a combo of oregano and cumin and salt and pepper and chile powder and garlic salt and whatever spice in your arsenal seems Mexican-y. You know what to do. What? Is the president coming over? No. He’s not. You will be seasoning meat in such a way that your loved ones will eat it, not the King of Siam, nor even Katie Couric. Get a grip on your expectations, Fanny. 1 tube of tube biscuits. I use Pillsbury. Not the grocery store kind, because I am suspicious. Although you know what? 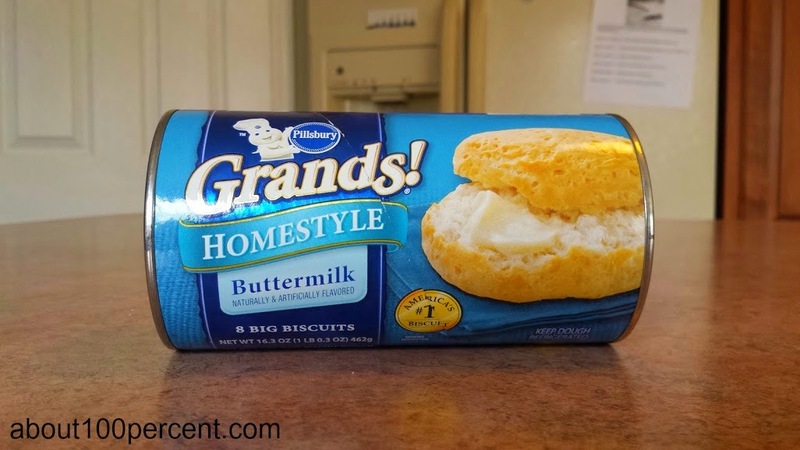 Once I bought some brand name tube dough and when I popped it open, the seal must have been broken and the dough was rubbery and gray. Ugh. I almost baked it up anyway but I got hold of myself and chucked it. I still think of what might have happened if I would served it anyway. I saved my family’s life that day. Shredded cheddar, or taco cheese if you’re fancy. You fancy, huh? We just use ched. Taco toppings like sliced black olives, salsa, guacamole, lettuce, sour cream, onions, taco sauce, chopped tomatoes, or goat cheese. Use any combination of your favorites. The night I made this, we used taco sauce, tomatoes, sour cream, and goat cheese. Yep. You read that right. Who’s fancy now, son? And that’s it. Now you know what’s coming. 1. Preheat your oven to 350 degrees. I hate when I skip this step. But don’t beat yourself up over it if you do the same. You’ve done far worse than this. Let’s talk about all the things you’re doing wrong with your life. 2. Crumble the ground meat in a skillet and fry it on the stove until it is no longer pink. Drain the fat! If you forget – gross. Add the seasonings (the packet or your own concoction) and about a ¼ cup of water. Cook and stir a little more until the water is absorbed. Dial down the heat to keep it warm, although you know what? Who cares? You’re almost done with this already. Go ahead and turn the heat off. You’re the star of this show, chief. 3. Pop the dough and separate it into individual biscuits. I used one tube of eight biscuits, but if you want more, then by all means make more. 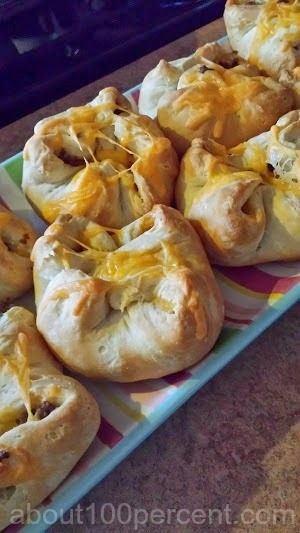 We only have four people in our household, and hello, this isn’t the most healthy meal ever (because: biscuit dough from a tube AND ground beef) so no one needs to eat more than two of these bad boys. This particular night, I ate only one and that was enough for me, and to give you an idea of my normal eating habits, over the past three days I consumed an entire bag of pretzel M&Ms all by myself. So obviously I am a hog, and I still only ate one Taco Pinchy. 4. On a cookie sheet, squish the biscuit circles down until they spread out a little. Use your fingers or a spoon or a rolling pin if you like to wash kitchen utensils. I used my fingers. You’re going to scoop the beef filling into these babies, so make ‘em as big as you can. 5. 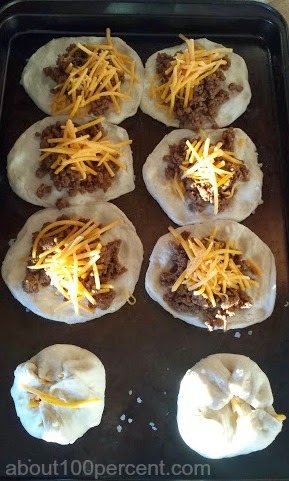 Scoop about 2 T. of the taco meat into the center of each biscuit circle. Top with shredded cheese. You know how much to use. Gather up the edges of the circle and sort of pinch them together to close the biscuit up. It will look like a little taco beanbag. 6. 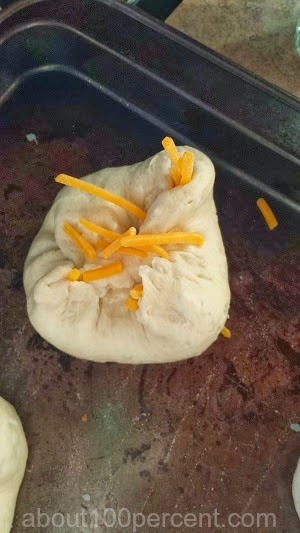 Bake ‘em in the oven for 18-20 minutes, or until they are golden brown. Watch them near the end of the time, because on the tube it says 13-17 minutes but because of the meat and cheese they’ll take a little longer than that. I think mine took about 22 minutes, but I was drinking wine when I made this and you know how that is. And that’s it! Serve them to your family and try not to scream in defeat when they ask, “What is this? How do we eat this?” Lay out the toppings, serve yourself first, and ignore their questions. With any luck they will follow your lead and you won’t have to explain to your family HOW TO EAT FOOD. We ate Taco Pinchies with cut up veggies and some leftover taco meat, which is a strange side for tacos but if you mix it up with goat cheese it almost tastes like something else. I was pretty much the only one who ate any leftover taco meat, which could better account for why I only had one of them at dinner that night. And that, my friends, is why every single mom is crazy. I knew this was going to be a fun read the minute it popped up in my feed. I wasn't wrong. I love the way you share a recipe - so much better than a standard boring one!!! And, this sounds like a perfect quick fix on those nights when nothing sounds right!!! Thanks Kim! This is one of those quick dinners for sure. The best part is that there's nothing to complain about! You're so right! Tacos and bread - there's nothing bad about that combination whatsoever. I think that every Pinterest user should have a board like this one. Of course, mine would contain things like "Hotdogs" and "The Crumbs In The Bottom Of All The Chip Bags." This is so brilliant and I LOVE your recipes! Your comment made me giggleth. I am scared of tube biscuits. It is the anticipation of the popping. And potential for eye loss. PS these are like homemade hot pockets. The anticipation is the worst. I imagine it's like what Ultimate Fighting Champions feel like when the bell rings. Maybe. We call that type of rolls "wompems" because you womp them against the side of the counter to open them. I have made delicious meals out of those rolls, including pizzas. 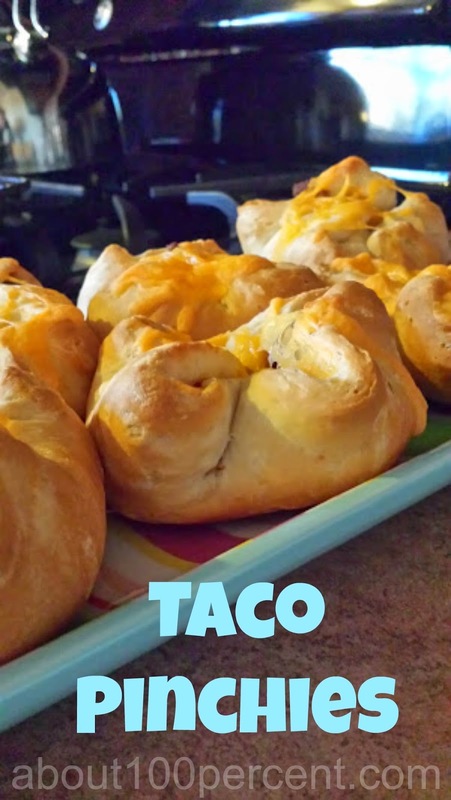 I'll need to try this taco yumminess! I have never made pizzas from these. I will have to try this next. I wish I worked for the recipe division of the companies that make tube dough. My dream job! Love this idea and, as always, you are freakin' hilarious!!!! BAHAHAHAHA BRILLIANT. And they look delicious. I do so miss tube biscuits. I think you could make a GF version. But then of course that would ruin the whole easiness factor. Just do the leftover taco meat with goat cheese, then. I completely loved this - awesome. My sister is terrified of tube biscuits - I have no idea why, but they scare the living hell out of her. So I'm guessing she will not be making taco pinchys. I think they're fabulous! Stay tuned...I'm about to embark on a "clean out the pantry and fridge" run so there may be fun food to come on my sad little blog! Thanks, Lisa! My grandmother and your sister would get along fine. I love your recipes. I'm always amazed what you come up with, especially when you do things like "I followed this recipe but left this out and added this and this and this instead..." and it turns out being fabulous. I can't wait to see what's left in your pantry and fridge! For the record, this pretty much constitutes "healthy" around my house since most of my recipes begin with one pound of pasta and end with two pounds of cheese. Give or take. But I'm seriously (no really, seriously) going to make this tonight since A. I have all the ingredients already. Not to brag B. The president is not, in fact, coming - as you so rightly predicted C. There's leftover goat cheese in my refrigerator. Right now. Oh, you fancy too, huh? I pretty much consider that anyone with leftover goat cheese is a VIP of some kind. Sort of the same way I consider that people who say they have leftover wine are crazy. I'll see your one pound of pasta and two pounds of cheese and raise you several cans of 'cream of" soups. Not *always* fancy...but definitely after I host book club. My whole family loved it. And I didn't even have to go to the grocery store. So thank you. From all the VIPs here. p.s. Leftover wine. Huh. I'll have to Google what that is. OMG I AM SO GLAD YOU MADE THIS. And that your family loved them, AND that you had all the ingredients already. What does buen provecho mean? I don't understandeth. Can I have the gluten-free version please because this looks really good! Alas, there IS no gluten free pop up dough and I lead an empty existence. Ha ha Jennie! You have exposed my imposter status. I looked up Bon Appetit! in Google Translate and got this. My Spanish-speaking friends are shaking their heads. Yummy idea and what a fun post! I literally lmao reading the ending. Haha!